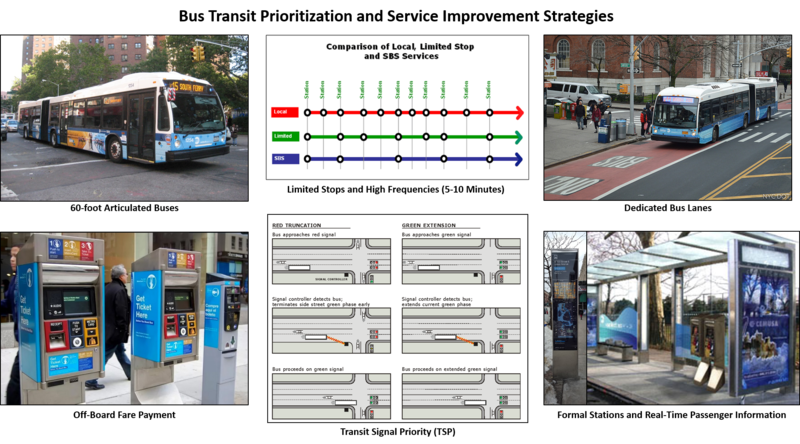 Is New York City’s Select Bus Service A Potential Model for Improving Metrobus? New York City’s Select Bus Service may provide an excellent model – and a few cautionary lessons – for WMATA’s Priority Corridor Network and a Metrobus Off-Board Fare Payment System (OBFPS). Earlier this year, a small team of planners from Metro’s Office of Planning, the Office of Bus Planning, the District Department of Transportation (DDOT), and DC Surface Transit had an opportunity to visit our colleagues in New York and to see their Select Bus Service (SBS) in action. Metro and our partners think it may provide both a good model and some cautionary lessons as we move forward with bus prioritization strategies, off-board fare payment, and the Priority Corridor Network. Who’s on the Bus on 16th St. NW? Metro planners and DC residents alike have advocated for a possible bus lane on 16th St. NW, where Metrobuses carry over 50% of the people, are scheduled for about every two minutes, and are frequently bunched and overcrowded. The survey can tell us what kinds of riders use that corridor – giving us clues to what kind of new riders a bus lane might attract. S-Line riders are younger and more affluent, than the system-wide average for bus riders. They are slightly more likely to be car-free and employed by the federal government, but the difference is very small. Metro is exploring opportunities to partner with a private company or investor to pilot off-board SmarTrip® loading to help improve customer travel times and lower our operating costs. Metrobus speeds have steadily decreased over time as the region grew and traffic worsened. This not only negatively impacts Metro customers, but also increases our operating costs. As traffic congestion erodes bus speeds, we need to deploy more vehicles and operators on the busiest routes in order to maintain service frequencies. We know that behind the statistics stand legions of bus riders who want faster service, as well as counties and cities that want lower bills for that service. Does Metrobus Need a Refresh? Metrobus has a strong identity as a regional transit provider, but as the region has grown it hasn’t kept up with changing development patterns. Does the regional role of Metrobus need to be rethought? A previous post described the historical context of Metrobus as a regional bus service provider, as well as the Metrobus regional service criteria developed by a regional “Blue Ribbon Mobility Panel” in 1997. What has happened to the Metrobus regional service since the 1998 Board action? Does today’s regional service still meet the original criteria? Metro’s planners recently conducted an assessment to address these questions. Overall, Metrobus regional lines provide higher levels of service and achieve higher cost efficiency than non-regional lines. Currently Metrobus operates 106 regional lines and 55 non-regional lines The overall higher ridership of the regional lines resulted in an average operating cost of $3.50 per passenger trip, lower than the non-regional service at $4.50. 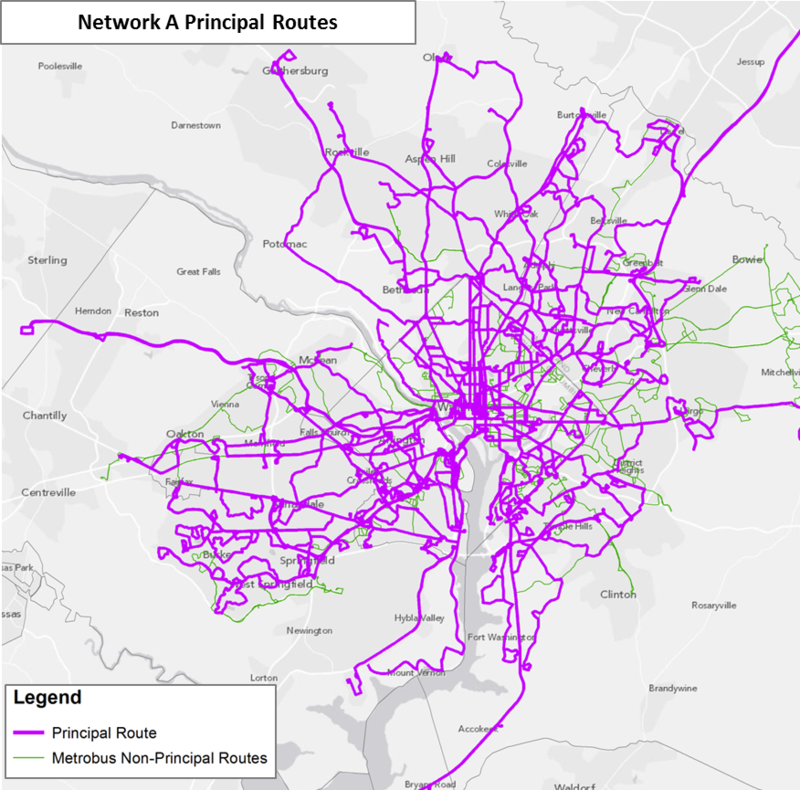 Metro is re-imagining the region’s bus network to improve travel times, enhance connectivity, and deliver service cost-effectively. 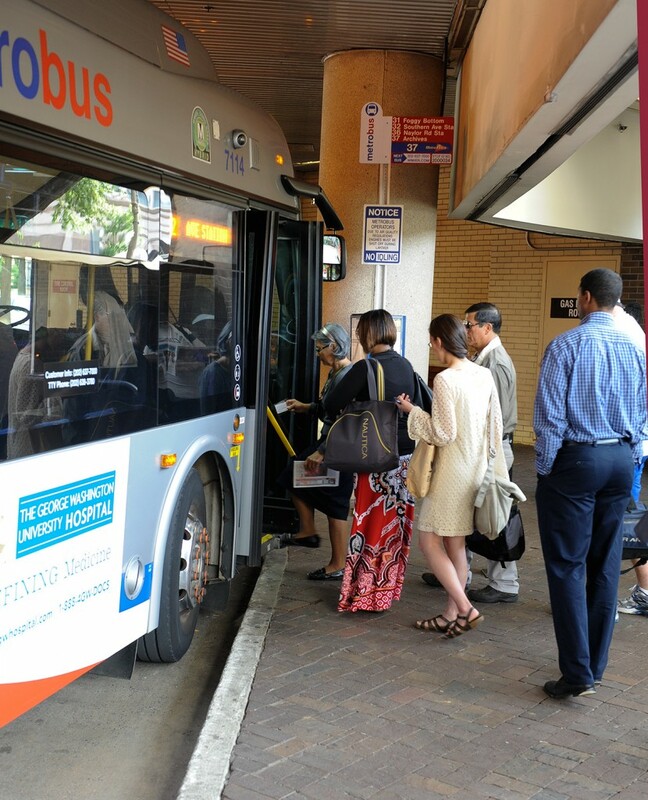 Over the past year, as part of the Metrobus Network Effectiveness Study, Metro began exploring potential future Metrobus restructuring scenarios based on the region’s growth trajectory over the next two decades. The scenarios also reflect the market segments where Metrobus can be more effective — places like the urban core, activity centers, and major arterial streets. Planners took the Metrobus network in the region’s Constrained Long-Range Plan (CLRP) for 2030 as the basis of comparison and formulated several network restructuring alternatives. This post will introduce the alternative networks, while future posts will present the performance of the networks, as well as a completely new proposed network built from the ground up. The flow chart below illustrates the network alternatives, followed by a brief explanation about each alternative. Where are the Late Night Metrobus Riders? The majority of late night bus boardings are in DC, focused along the 14th/16th Streets NW corridor. As we’ve mentioned before, Metro is conducting a study examining late night bus service in the region. An initial step was to assess where the late night boardings are happening in order to determine which might be the best locations to focus in-person survey efforts. 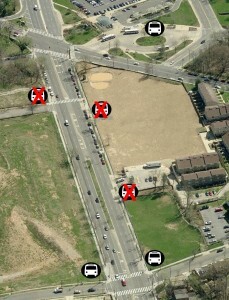 Below is a map showing the locations of the top 100 locations where riders board Metrobus from 11pm-4am each night. Rather than reflecting the total ridership of a stop, the magnitude of the circles on the map reflect that location’s share of overall late night bus ridership. Almost all of the major bus boarding locations (those with more than 1% of the total) are at Metrorail Stations, even though Metrorail stops operating just one hour into the late night period on weeknights. Not surprisingly, most of the boardings are in DC, many of which are concentrated in the 16th/14th St NW corridor from downtown to Columbia Heights. 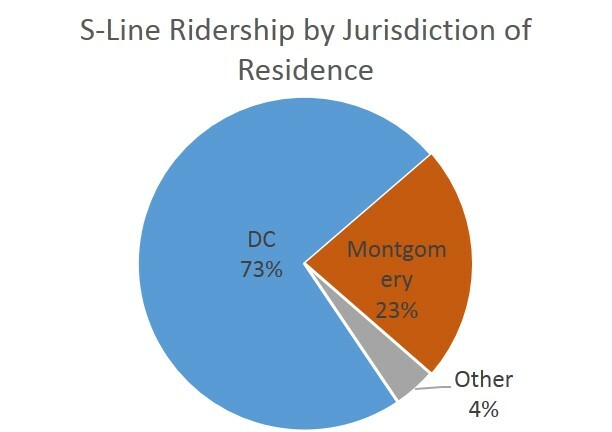 The data only reflect Metrobus boardings, so if boardings on local operators such as DC Circulator are added, the total numbers of late night bus boardings would be higher than what is shown here. Of course this only tells us where the riders are boarding, not necessarily where they’re going; we are investigating that as part of the study. What do you see that stands out? * Note that Southern Avenue Metro Station replaced 14th & U Street as an in-person rider survey location. 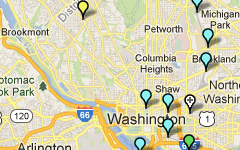 The distance between stops is of key concern to Metro and its customers. More closely spaced stops provide customers with more convenient access, as they are likely to experience a shorter walk to the nearest bus stop. However, closely-spaced stops are also likely to result in a longer ride for customers because of the number of times the bus stops — to decelerate, come to a complete stop and then accelerate and re-merge into traffic — is increased. This also can lead to increased fuel and maintenance costs. Having fewer stops along a bus route benefits passengers not only by reducing the time it takes for them to make their trip, but by making the service more reliable and predictable. The distance between stops is of key concern to Metro and its customers. More closely spaced stops provide customers with more convenient access, as they are likely to experience a shorter walk to the nearest bus stop. However, closely-spaced stops are also likely to result in a longer ride for customers because of the number of times the bus stops — to decelerate, come to a complete stop and then accelerate and re-merge into traffic — is increased. This can lead to degraded service quality for bus passengers and increased maintenance, and operating costs for Metro. Having fewer stops along a bus route can benefit passengers not only by reducing the time it takes for them to make their trip, but also by making the service more reliable and predictable. When stops are analyzed, several factors will cause them to be taken out of consideration for removal. These reasons include stops in front of a school, house of worship, community center, senior housing, park, transfer point, or other popular amenities. These bus stops will not be removed irrespective of usage. 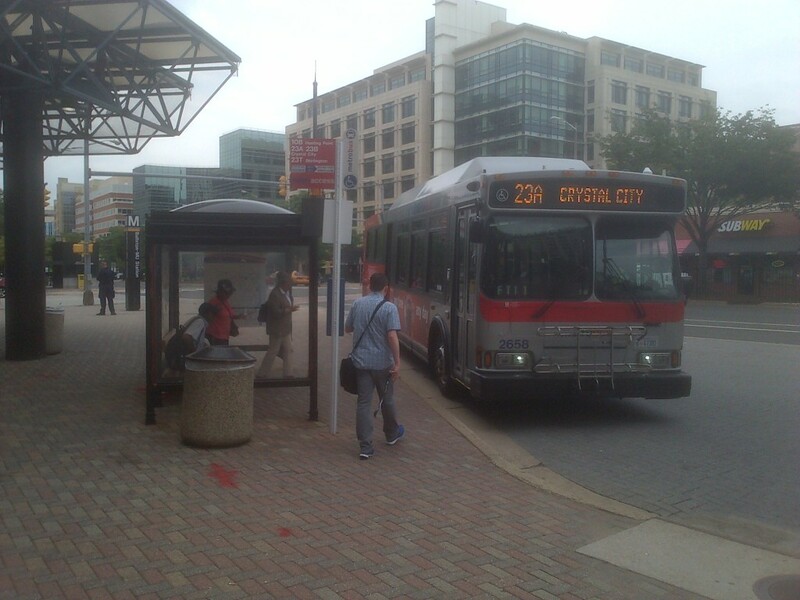 Metro bus planning proposes 22 bus stops for removal along the 96/97 routes. East Capitol Street, looking east-southeast just west of Capitol Heights Station, where two east-bound and one west-bound bus stop are proposed for removal. 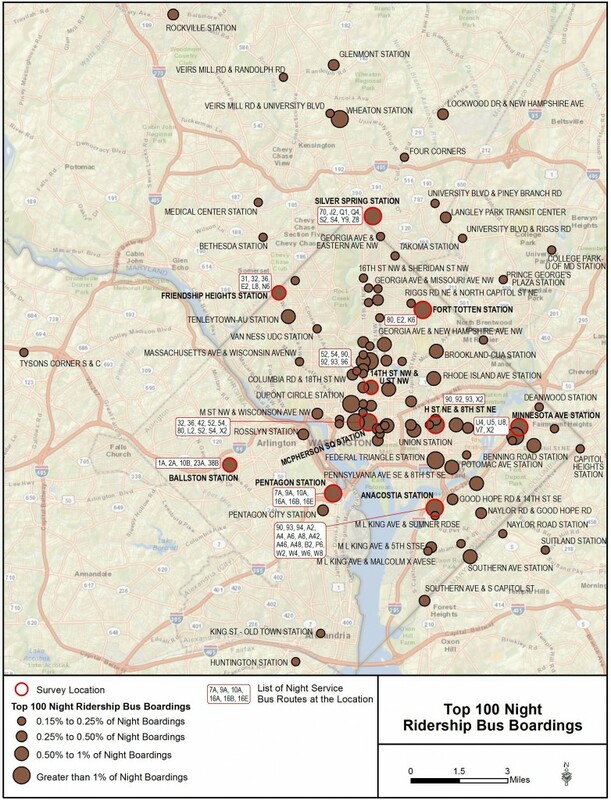 In September, WMATA selected 27 stops for consideration to discontinue on the 96/97 route to provide faster service. All 27 stops are within a block or two of another stop. The list was posted on this blog, and wmata.com. Notices were posted at the affected stops, and WMATA met with representatives of council members’ offices whose districts are served by the two routes, and corresponding ANCs in September 2013. There was a month-long period where members of the public commented on the list via phone, email, and blog post. East Capitol Street & 52nd Street SE, eastbound, due to its location in front of the Episcopal Church of the Atonement. In total, 22 bus stops will be discontinued, 12% of the total stops on the 96/97 route. 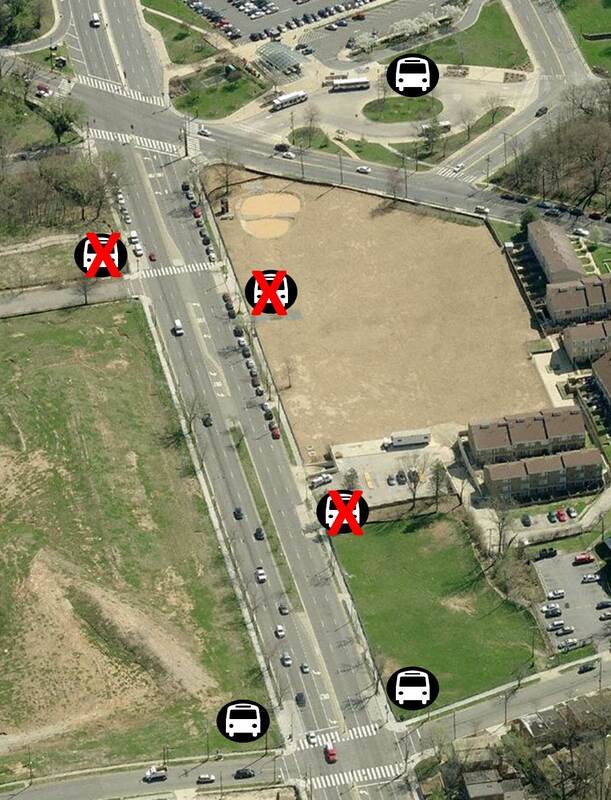 Maps showing the bus stops to be removed at the December 29, 2013 service change are shown below. Two weeks prior to the service change, notices will be posted at the affected stops informing customers of the change. The notice will also include information on next closest bus stops.